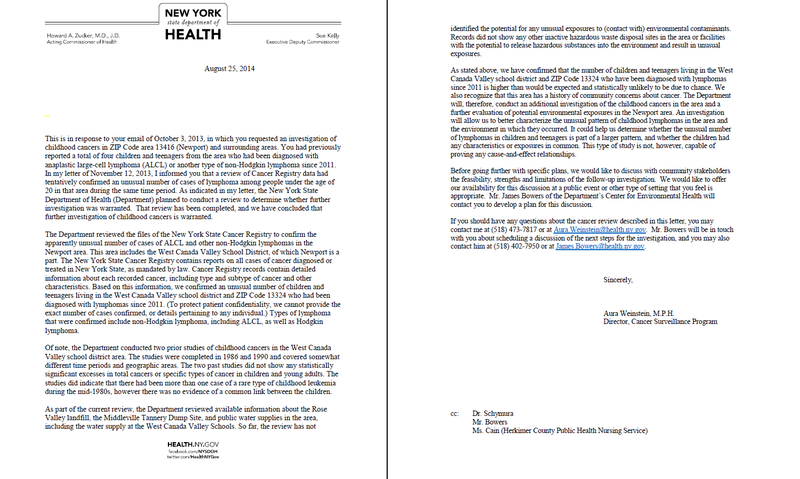 As concerned parents and citizens of a very sick community, we write to you pleading for your help. Since the 1980’s, the Kuyahoora Valley in upstate NY has been filled with numerous cancers and sickness. This valley is comprised of Newport,Middleville, Fairfield, and Norway where the population combined is just around 6,000. 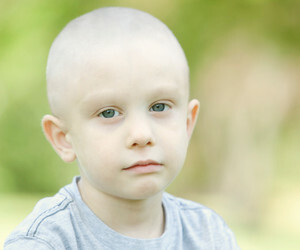 There were 9 pediatric cases of cancer in the mid 1980‘s. Most of the cases were leukemia, one of which resulted in death. 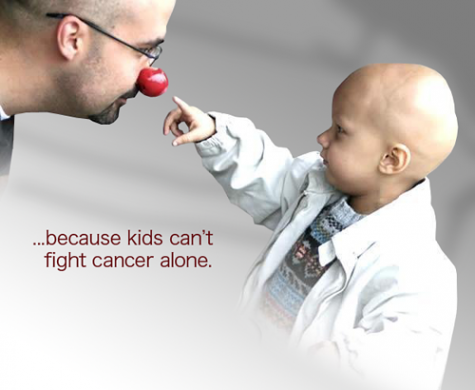 Six pediatric cases of cancer were diagnosed between 2011 and 2013. Three of the cases were a very rare form of lymphoma that approximately fifty people in the entire Unites States get each year. It is called Anaplastic Large Cell Lymphoma (ALCL). Our small town made up 6% of this particular lymphoma. Also, a five year old girl was diagnosed with an incurable brain cancer in 2007. Over the years, sickness has continued and the townspeople have become accustomed to raising money for benefits so those who are sick o r dying can pay for their medical bills. People have been helpless and don’t know what’s causing this or who they will know next to be diagnosed with cancer. While writing this letter we found out that a mother in her early forties has pancreatic cancer. There is a benefit for her this coming weekend. Every few months before that for the last 3 decades there has been a similar diagnosis. This is not normal. We’ve recently had two community meetings with the NY State Department of Health because our small, rural community has seen a surge in pediatric cancers as well as many adult cancers and other health issues. This is the third investigation the DOH has done for our area since the 1980’s. The DOH gets calls frequently from people concerned about high numbers of cancer in their area. They told us they take on two cases per year and our case was one of them. They said that the number of pediatric lymphoma cases was “higher than would be expected and statistically unlikely to be due to chance.” Unfortunately, the DOH doesn’t have the resources to do proper testing but can do another 18 month investigation to tally up birth defects and total cancer counts. We need answers sooner because we are frightened for the lives of our children and loved ones. We’ve worked to determine what it is that is different in our community from other communities like ours and the most obvious thing is the Newport Antenna Radiation Pattern Measurement Facility which is a military radar testing facility operated by the Air Force. www.cybernyalliance.org. The facility is known to be one of, if not the largest of its kind in the United States. The only other military radar towers like this are located in the desert out west. The facility is also an electronic warfare testing site that can distribute harmful levels of microwave radiation used for jamming radars. There are many recent studies that have been done pointing to the detrimental effects of non-ionizing radiation on biology and the causation is there. We have good reason to think that pulsed electromagnetic radiation is triggering mutations and damaging DNA/RNA resulting in cancer, birth defects, autism, etc. Radiation from testing at this site has affected the people in our town for over 40 years. Long term exposure to microwave radiation has recently been linked to increased cancers. Severe weather, aircraft and ground obstructions reflect, refract and scatter the radiation (like wind turbines) and complicate the problem. In 2010, there were 37 wind turbines installed at Hardscrabble Windfarm. The turbines are located on some hills directly across from the military radar towers a few miles away. 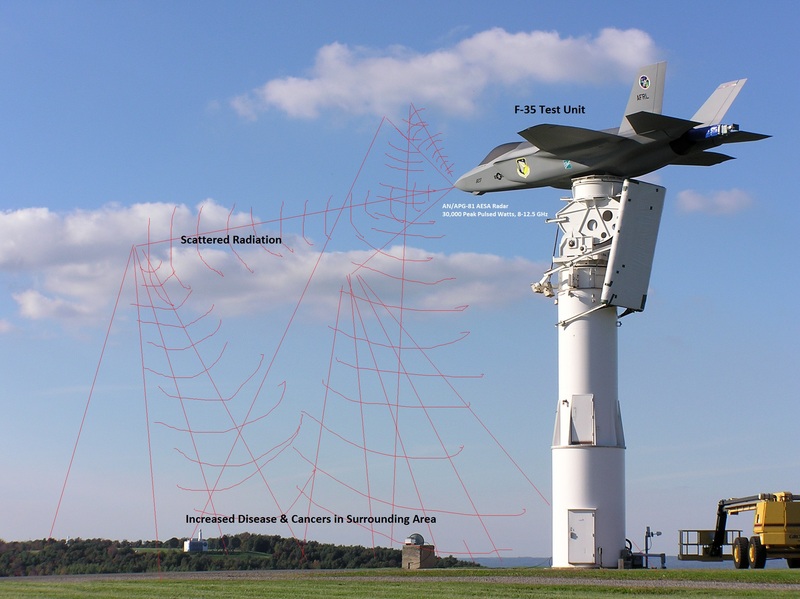 We know that when the radars are performing tests, radiation scatters off of the turbines onto the surrounding ground.https://www.fas.org/irp/agency/dod/jason/wind.pdf Radiation is most likely scattering and reaching human beings in their homes and/or cars as a result. The turbines were put up in 2010 and in 2011 a cluster of children became sick. There is also a main roadway 2000 feet below the radiation test facility with only small RF/Microwave reflection fencing below the radars. We have been consulting with a senior chemical engineer who works for a large, international engineering consulting firm . 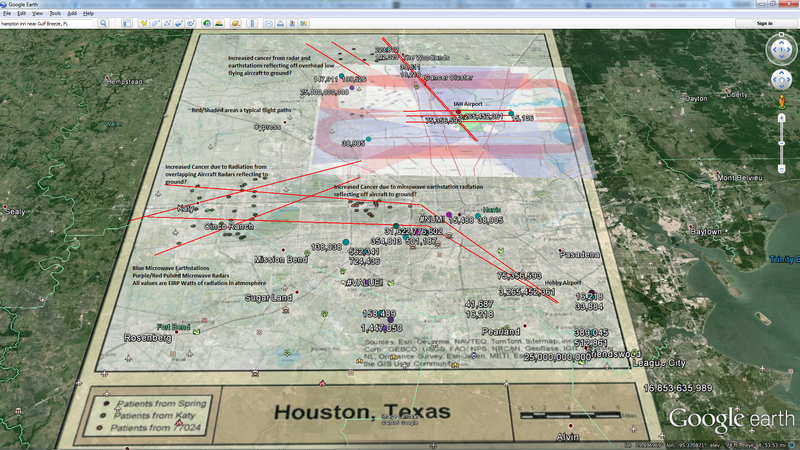 He discovered our case while studying the health effects of radar on humans and wildlife for the past two years. 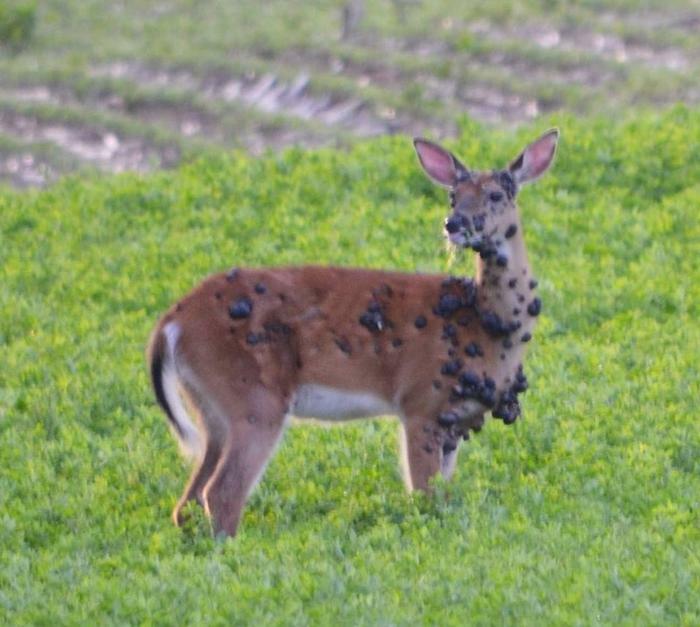 In addition to the sick humans, we also have a wildlife “chronic wasting disease” cluster in the surrounding area. He is working on a human health study involving pulsed microwave radars that will eventually be published in a peer reviewed journal. He said that many of the frequencies being used at the Newport test site have already been proven harmful to biology. He said there is a correlation between the locations of radar and disease and that he knows of 5 other electronic warfare locations that have cancer clusters. He said that the test range scattered radiation of the Newport facility is likely causing and/or increasing many of the health problems. One of several things he suggested was that we find an Environmental Assessment/Impact Statement for the Newport, NY Test Facility. He said that since they are testing AESA electronic warfare radars with the F-35, it should be required (See Radar AS DEATH RAY). So far, we have not been able to find one. Due to the extreme amount of disease in our local community we believe ALL RADIATION TESTING SHOULD BE STOPPED until an actual environmental impact assessment has been done. Birth defects are also common with ionizing radiation. http://ntl.bts.gov/DOCS/3910-3a.html. The high power, high gain pulsed radars have effective isotropic radiated powers in the millions and billions of watts and may in fact be ionizing. Please consider helping us get to the bottom of our town’s health epidemic. We fear it will only keep happening and possibly get worse until it is addressed. We appreciate your time and look forward to hearing from you soon! rare birth defects, including autism. Mother of a 12 year old son in remission from ALCL. Concerned mother of 3 young children.